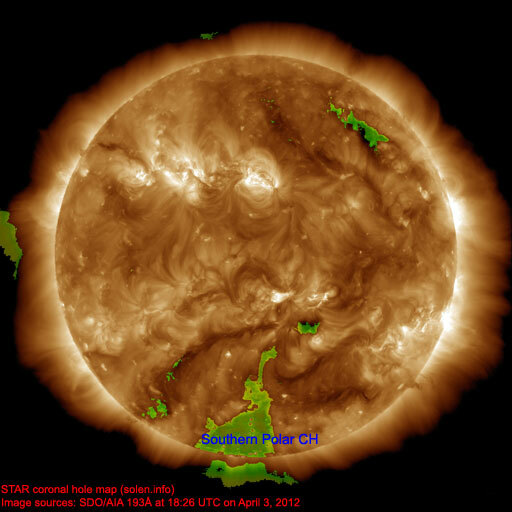 Last major update issued on April 3, 2012 at 04:30 UTC. 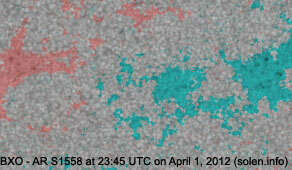 The geomagnetic field was quiet to active on April 2. 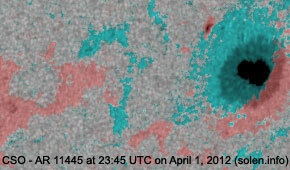 Solar wind speed at SOHO ranged between 279 and 354 km/s. 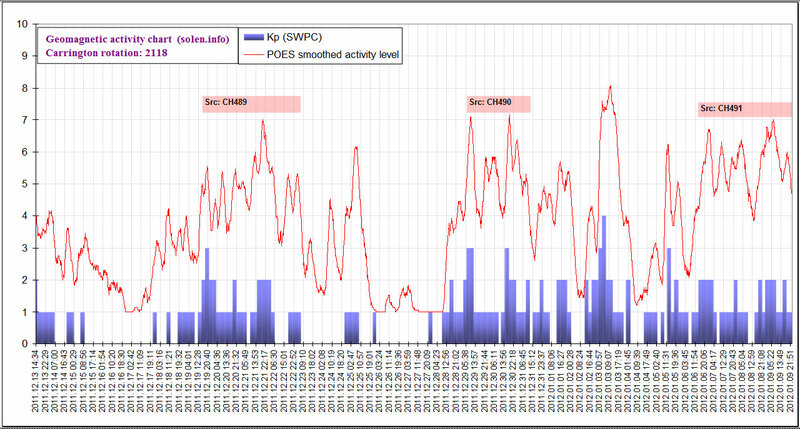 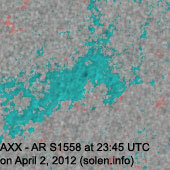 Solar flux measured at 20h UTC on 2.8 GHz was 105.6 (decreasing 32.5 over the last solar rotation). 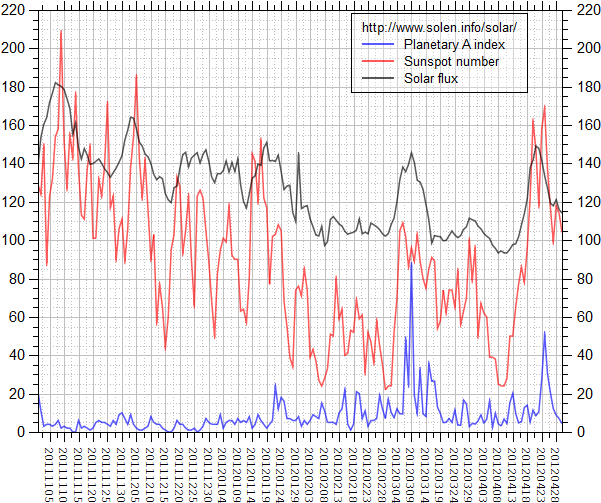 The Potsdam WDC planetary A index was 11 (STAR Ap - based on the mean of three hour interval ap indices: 10.9). 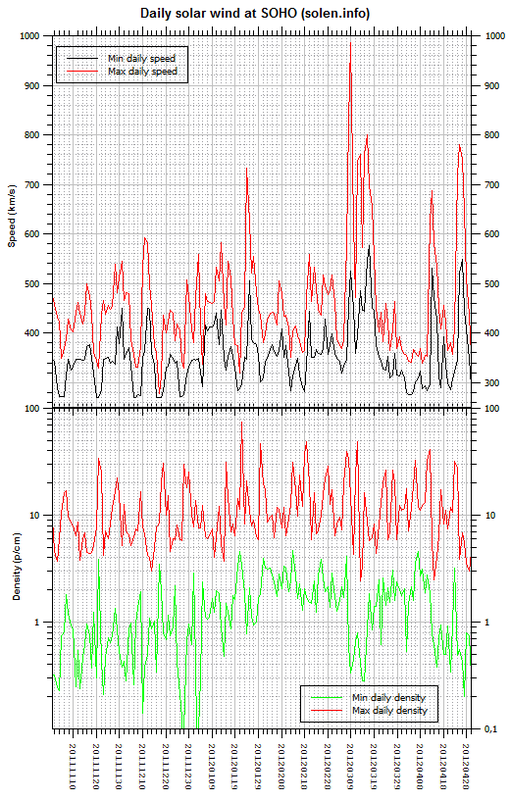 Three hour interval K indices: 43223212 (planetary), 33212322 (Boulder). 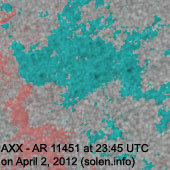 Region 11445 [S22W58] was quiet and stable. 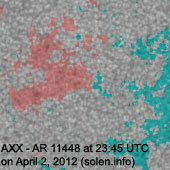 Region 11448 [S18W06] could become spotless today. 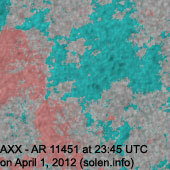 Region 11449 [S19W74] decayed and was quiet. 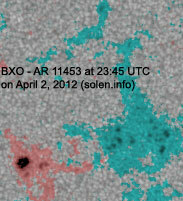 Region 11450 [N15E09] developed slowly and is becoming an interesting region. 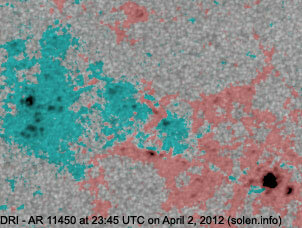 There's weak polarity intermixing. 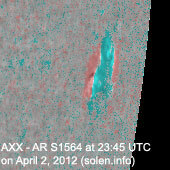 C flares are possible and maybe even an M class flare if there's further development. 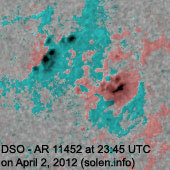 Region 11451 [N17E27] was quiet and stable. 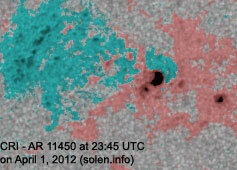 New region 11452 [N17E48] emerged near the northeast limb on March 31 and was noticed by SWPC 2 days later. 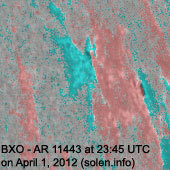 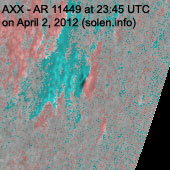 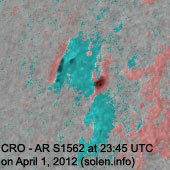 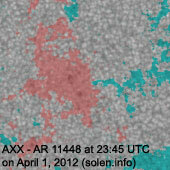 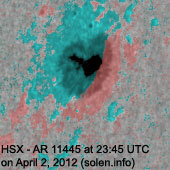 New region 11453 [S17E03] rotated into view at the southeast limb on March 27 and was numbered by SWPC 6 days later. 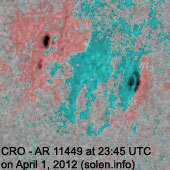 March 31-April 2: No obviously Earth directed CMEs were observed in LASCO and STEREO imagery. 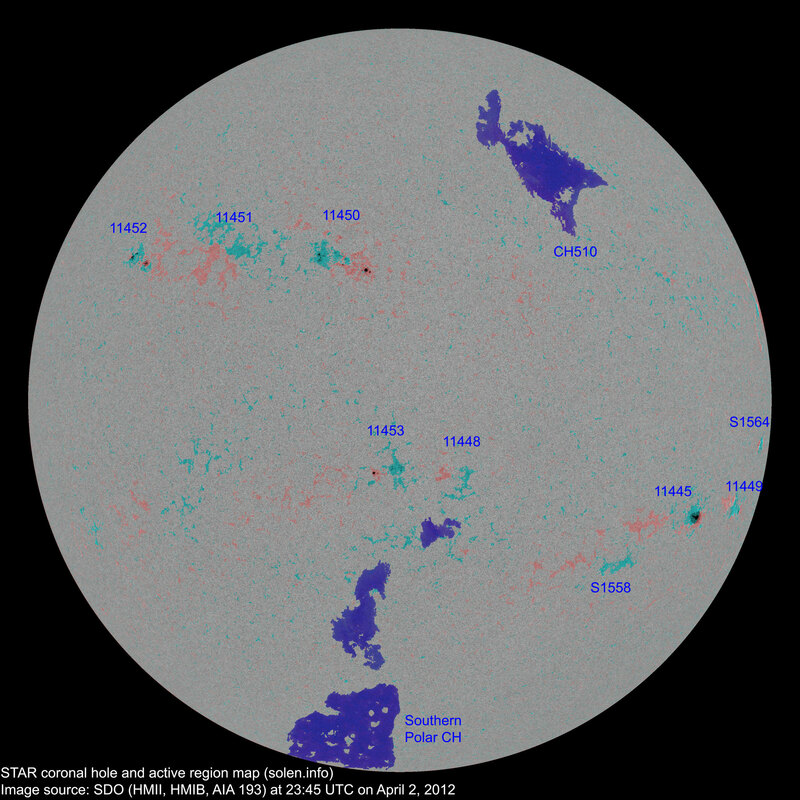 The geomagnetic field is expected to be quiet to unsettled on April 3-4 with occasional active intervals due to weak effects from CH510 and CH511. 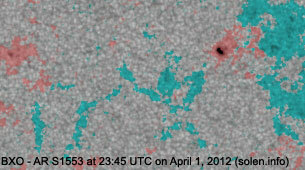 Quiet conditions are likely on April 5.